This is your captain speaking. We are on our final approach to O’Hare Airport in Chicago. Winds are 20 miles per hour from the Northwest, and the current ground temperature is 14 degrees Fahrenheit. Instinctively, I turned to my right to look out the porthole window. Snow. My heart sank. Returning from a six month stay in Denmark, I had not prepared myself for the reality of returning to Chicago in late December. Despite being several latitudes further north, it rarely snows in Denmark. As I turned around to complain to my wife, I caught a glimpse of the famous skyline out the opposite window. Immediately, my thoughts turned to the man-made wonders of Chicago. By the time the plane lined up for landing, I had a perfect aerial view of the city – a skyline that no city in Europe can match. The excitement of returning home insulated me from the cold as I walked up the long jet way into a new chapter of my life. Construction on the terminal started in 1985. My company first started working on airport buildings in the late 1960s in San Francisco. Today, that portfolio has grown to include projects as far away as the United Arab Emirates. 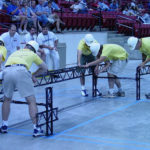 Aviation is a huge market for almost all disciplines of civil engineering. In fact, many airplane designers, including those working with advanced composite materials, are recruited from the ranks of civil engineers. Although it was freezing outside, I was able to enjoy the December sun inside the bustling terminal. I’m rarely so poetic about my time in an airport, but this occasion seemed special. I was fondly looking ahead to the projects and activities awaiting me in Chicago. Likewise, I am excited about this opportunity to continue sharing my story with you. We have a lot of new feature planned, including YouTube videos and reader polls. 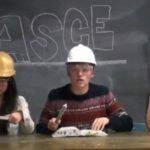 I want to focus especially on making this blog compelling to ASCE’s student members, but everyone is welcome to participate in the experience. Finally, I look forward to your comments. For me, the most exciting part about writing this blog is reading your reactions to it. Please look down. The moving walkway is about to end. It’s time to move on.